Trail running shoes: they may not be the answer to all of your slippery, sliding, backcountry needs, but perhaps it's exactly what you're looking for... but, what is a trail running shoe? Let’s dive into a few things to look for and what separates these from your run of the mill road running shoe or hiking boot. You’re walking down your favorite trail, newly watered by an autumn shower, when it strikes. That misstep or unexpected slide leading to feelings of both weightlessness and panic: will you get that other foot down in time or end up kissing mud? Enter: the trail running shoe. Though it won’t be the answer to all of your slippery, sliding, backcountry needs, perhaps it could be the assist you’re looking for during those especially rugged days. 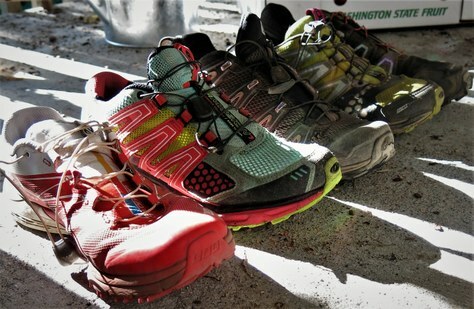 So… what is a trail running shoe? Let’s break it down into some of the most important features, things that anyone in search of this fanciful beast should know to look for and what separates these from your run of the mill road running shoe or hiking boot. If you’re new to running, hiking, or other let’s-spend-a-long-time-on-our-feet-repeating-the-same-motion sports, then some of these can be tough questions for you. However, chances are that you have some sort of experience when it comes to your 'feet needs'. Take note of those as you read through your options. When approaching the wild trail running shoe you may notice it has much less flex than your average road running shoe, but much more than your hiking boots. Trail runners (the shoes) are the compromise between the lighter weights of the road shoes and the stiff, often shanked hiking boots. They provide enough support that your foot shouldn’t be folding around rocks (you can test this by putting the middle of your foot around a hard edge when trying on a new pair), but not so much that you’d be able to kick your own steps into ice or snow. Bad ankles? Me too. Another tradeoff with trail runners is reduced ankle support. For me, I’ve been able to navigate this with a series of interior of shoe or interior of sock ankle devices (not to mention ankle exercises). This may not work for everyone, but the comfort I gain from the weight and design of this type of shoe has made it worth it. Minimalist runner? No fear: there are trail running shoes for you as well! From ‘racing types’, the sleeker, lighter cousin of the stiffer trail runners, to a true zero-drop[i] meshed shoe with fantastic tread, types of trail running shoes have also been broadening. Similar or, dare I say, often more aggressive than your hiking boots, the tread on trail running shoes can cross the whole gambit, but, on average, falls on the deeper lug/tread pattern end of the spectrum. The deep tread grants seemingly magical sticking powers in types of mud, leaves, snow, and other soft materials. However, the same cannot be said for the three R’s: on wet roots, roads, or large rocks. Deeper tread means less friction-creating surface area on the R’s; it’s usually not a show-stopper, but be aware that it will sometimes be a better decision to run in the dirt on the side of the road than the asphalt itself, when trying to get to the trailhead. 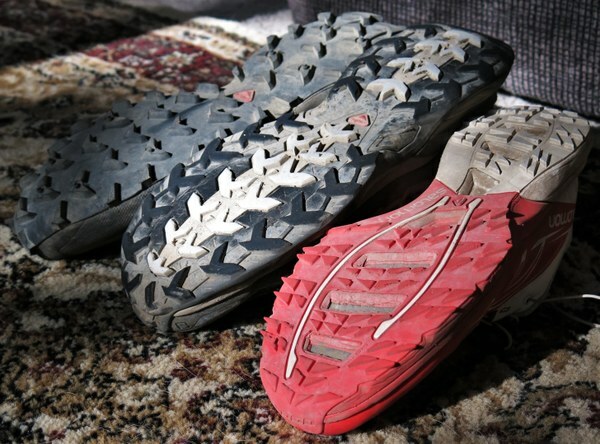 In addition, the tread material of trail running shoes is more similar to road runners than to hiking boots: it’s softer. 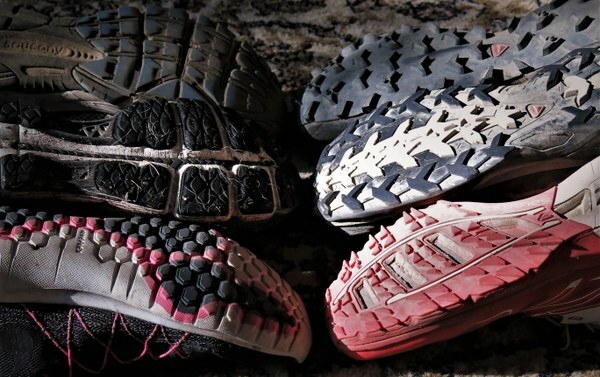 Unlike road running shoes, the geometry and tread patterns usually lend to more ‘sticking out’ areas, meaning that there are more places to get rubbed off easily. This is one of the reasons it’s important to evaluate the types of the terrain you’ll be running on the trail and to get to it, as running on roads will shorten the life of the tread. Basically, trail running shoes are usually fantastic for trails, but not for roads. No one likes a stubbed toe and you’re almost guaranteed to kick at least one rock on the trail. Why not avoid the whole issue by double checking that the shoes you’re investigating have an adequate toe cap? I usually see these as a polymeric (often rubber) material that flows up to cover the front of the two long toes. You want this material to be hard and flex the entire front of the shoe when pressed. Its job is to redistribute the load, i.e. the force from kicking the rock, onto the rest of your foot and leg, instead of just a toe or two. Save the toes! Let’s not beat around the bush, folks: we live in Washington. While the majority of the State is fairly dry, Western WA isn’t known for its sunny personality and Eastern WA has more than the occasional snow dusting. Trail runners have an answer for this too: impermeability to water, mud, and other debris built into the shoe by way of an membrane between the outer mesh and the inner shoe liner. Though it can’t keep your footsies dry in every condition, other than sinking your foot past the top of the shoe or water entering via the holes worn in them, they do a pretty good job keeping water out. Options like built-in or separate running/snow gaiters offer additional weapons for battling wet feet or dirt and debris. If you’ve spent any time on trails, especially in the Pacific Northwest, you’ll recognize what a gift this is. Make sure to check for waterproofing. I know it’s not for everyone, but I love a good quick lace system. Though I’m sure they existed in other corners of the world, I first encountered these beauties on trail shoes and wish they’d spread to all the other footwear in my life. Not only does it save valuable time pre- and post-run, I’ve found them to be both durable (usually outlasting the tread on the bottom of my trail shoes) and functional, doing a good job of keeping my feet positioned where they need to be. Into rad color combinations and looking to strut your stuff? Trail runners have your back here too. Look for the next installment of the ‘Tell Me About’ series, as I pursue some of the basics about gear — it’s fit and function — with the objective of getting more folks out on the trails and sharing our wonderful wilderness. 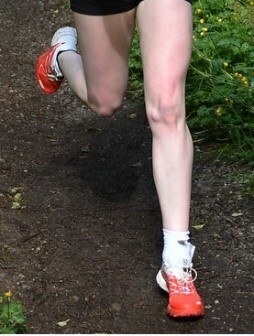 Also, interested in trail running or did you enjoy this type of article? Then keep your eyes glued on The Mountaineers and feel free to provide feedback or information in the comments below!